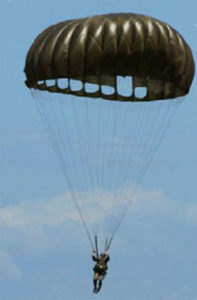 The MC1-1C maneuverable parachute assembly designed by the United States Army in 1988 from the basic MC1-1B canopy is used primarily for a premeditated jump when a precision soft landing in a small target area is necessary. MC1-1C: Standard configuration that incorporates a low porosity canopy cloth PIA-C-44378. MC1-1D: Incorporates the new Universal Static Line with Static Line Snap. Radial tape cut length is now cut 2-1/4” shorter (17’) to insure cloth fullness in main seam length. A Reinforcement tape was added under each bridle line on inside of canopy – main seam #5 and #6; #25 and #26. Zigzagged stitched reinforcement on the noted main seams was to provide greater tear resistance of the canopy. These changes create a fast opening canopy with a gliding type descent rate of approximately 4 to 5 feet per second, with more steerability (forward drive) possible.